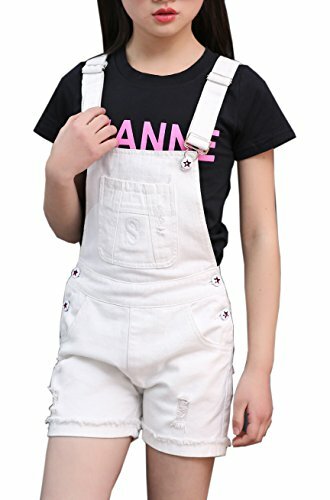 Sitmptol Big Girls Kids Denim Overalls Cute Jumpsuits Casual Boyfriend Romper 130 White by Sitmptol at Mas Fashion. Hurry! Limited time offer. Offer valid only while supplies last. How to pair denim Jumpsuit for your lovely girl 1. You can't go wrong with denim rompers. No matter what you pair them with, they will look stylish. 1. You can't go wrong with denim rompers. No matter what you pair them with, they will look stylish. Cropped tops, collared tops, sheer tops - these will all work. You can paired this with a sheer floral top. Let your girl be charming in this summer. 3-4 Years/ Little Kids (Tag Size 110 cm): Shorts Length:11".---Waist:24".---Height:41"
4-5 Years/ Little Kids (Tag Size 120 cm): Shorts Length:11.5".---Waist:25".---Height:45"
6-7 Years/ Little Kids (Tag Size 130 cm): Shorts Length:12".---Waist:26".---Height:49"
7-8 Years/ Big Kids (Tag Size 140 cm): Shorts Length:12.5".---Waist:27".---Height:53"
9-10 Years/ Big Kids (Tag Size 150 cm): Shorts Length:13".---Waist:28".---Height:57"
11-12 Years/ Big Kids (Tag Size 160 cm): Shorts Length:13.4".---Waist:29".---Height:61"
Sitmptol combines thoughtful details, luxurious materials and great design to deliver premium clothing that kids and parents love. Every collection passes through three filters-sophistication, nostalgia and wit-to make cool, covetable styles to delight every generation. The end result is playfully inspired pieces for kids that parents only wish came in grownup sizes. Feature: The Skinny Solid Color Distressed Denim Overall Shortalls are an everyday essential! They offer a skinny fit, Ripped detail, cuffed rolled up, button side closure, kangaroo pocket on chest, adjustable straps, classic 5 pockets, white star buckle detail. Design : Let your lovely princess look and feel simply amazing in stylish and versatile simply stretch Denim Short Overalls. Catergory : Jeans / Overalls / Jumpsuits / Rompers / Shorts Pants / Playsuit. Style: Simple, Stylish, Fashion, Cool, Classic. Occasion: Casual daily wear, Outdoor, Vacation, Home, Holiday, Party, Streetwear, School, Street, Dating, Outgoing, Picnic. Season: Summer.